"I like to come up with a new and interesting coleslaw to serve at Thanksgiving. With all the rich, heavy foods that the holiday table brings, I really enjoy the contrast these cold, crisp, bracing salads provide." Whisk together mayonnaise, rice vinegar, miso, and chile-garlic sauce in a large bowl. Stir cabbage, pear, and ginger into the mayonnaise mixture until well coated. Stir in green onions and sesame seeds. Season with salt to taste. See how to make a great fall and winter coleslaw. 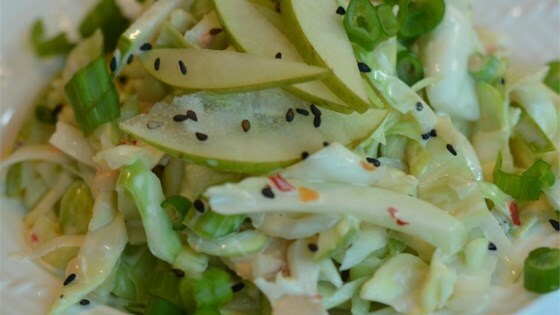 This slaw is best if tossed together no more than an hour or two before service. Even my picky eater mother ate it and asked for seconds. I wish I was joking, but she is a picky eater. I will make this again for sure. Made it pretty much as stated.